Last week, we shared our review of Plant Fusion’s plant-based protein powder. If you’re looking for something that’s a bit more than just a protein supplement, Plant Fusion also has a nutritional shake. Phood is their whole food meal shake with a balanced combination of protein, carbohydrates, omegas, vitamins and minerals, antioxidants, greens, and probiotics. The protein sources found in Phood are the same as the ones found in the original Plant Fusion protein powder: organic, sprouted quinoa, organic, sprouted amaranth, yellow peas, and artichoke. It’s also enhanced with BCAA and glutamine. The complex carbohydrates come from their proprietary blend of six organic grains: oat, amaranth, quinoa, buckwheat, millet, and chia. There’s also Baobab, a superfruit that’s high in antioxidants. The essential fatty acids come from a blend from flax, alagin (oil from algae), and sunflower. The greens comes from a blend of sprouted cruciferous greens. There’s also enzymes and probiotics added to ease digestion. 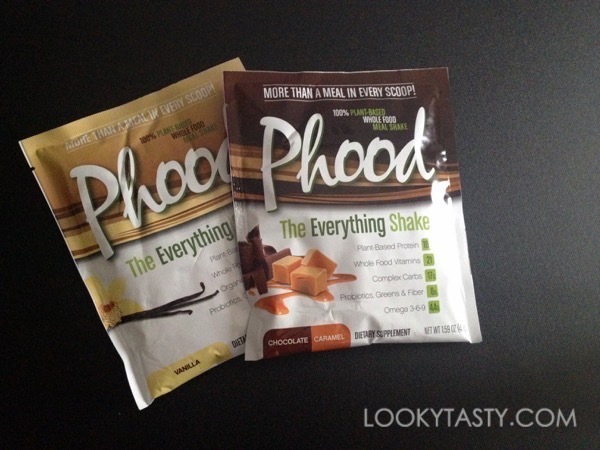 Phood comes in Vanilla and Chocolate Caramel. It’s sweeten with stevia, a herbal sweetener, and erythritol, a sugar alcohol, so that’s something to consider if you’re sensitive to them. You can simply mix it with water or a non-dairy beverage of your choice. I mixed the Chocolate Caramel with almond milk in a shaker. The shake is quite thick, much thicker than the regular protein powder. Although the caramel taste is light, I would have preferred plain Chocolate over Chocolate Caramel. I blended the Vanilla with almond milk, ice, and some frozen berries in a blender. It resulted in a rich and filling breakfast smoothie. Open to US residents. Giveaway ends Tuesday, July 28th at 11:59pm EST and a winner will be randomly selected shortly after. I like when protein powders aren’t too chalky-tasting. I look for plant based protein with ingredients I can read 🙂 I would LOVE to try this brand! i have to go with something that doesnt taste terrible. Low added sugar, high protein, and pronounceable (aka real) ingredients! I appreciate quality and value. I look protein powders which do not contain any preservatives.